The Crushinator is a robot living on a hydroponic farm on the Moon. She oddly is the daughter of a human hydroponic farmer whom she lives with, as well as her robot siblings. She was the wife of Billy West until his death in 3011. She also has a child, fathered by Bender, named Junior. She was elected Miss Earth's Moon and took part in the Miss Universe competition in 3001. The Crushinator moves on tracks and can be used as lunar mobile for the Hydroponic Farmer (Pa) and the other two robot daughters. She can dig through rock quite easily, but is not very agile. This may be due to the fact she is less humanoid in shape. 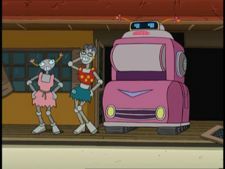 Despite her somewhat ungainly appearance the Crushinator is apparently considered to be extremely attractive by robot standards, as evidenced by Bender's attraction to her in "The Series Has Landed" and her appearance in the Miss Universe competition. She is one among few Futurama female characters to be voiced by men. She is also one of the most inconsistently voiced character on the show. In her first appearance, her monotone voice is more nasally. In both "The Lesser of Two Evils" and "Crimes of the Hot", she has a deeper baritone voice. In "The Silence of the Clamps", her voice has more reverb. She danced with a Killbot at the 100th Delivery Party. Crushinator: No Pa. I love him. Crushinator: Thank you, Bob Barker. I'm as happy as a girl can be. End statement. Fry: Oh, Bender. You didn't touch the Crushinator, did you? Bender: Of course not. A lady that fine you gotta romance first. This page was last edited on 10 June 2016, at 16:36.